Spring is around the corner so I want to give you all one more soup recipe before warmer days set in. This is a delicious take on an Olive Garden favorite. 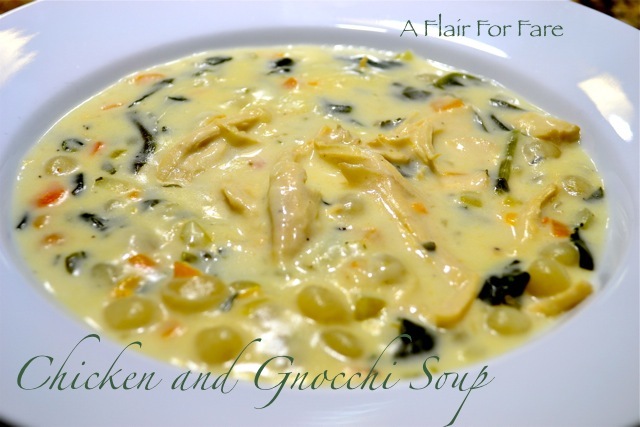 Who wouldn’t love this creamy chicken soup full of billowy potato dumplings? I like to use mini gnocchi and get a dumpling in every bite. Rub a large skin on split chicken breast with olive oil. Season with salt and pepper and roast at 350 for 45 minutes to 1 hour. Use a instant read thermometer to check for doneness. (165 degrees). Cool, remove skin and bone and dice. (You can also use the breast from a store bought rotisserie chicken). In a dutch oven over medium heat, sauté onion, celery and carrots until tender. Add garlic and spinach and cook until spinach has wilted. Add broth, thyme and parsley. Increase heat and bring to a high simmer. Add gnocchi. Lower heat and continue to simmer 10 minutes, until gnocchi floats to top. Add chicken. Mix cornstarch with half and half and add to soup. Stir in well. Add salt and pepper to taste. Bring back to a simmer for a couple of minutes then remove from heat and serve. Top with freshly grated parmesan if desired. If soup is too thick you can add milk or broth to thin.